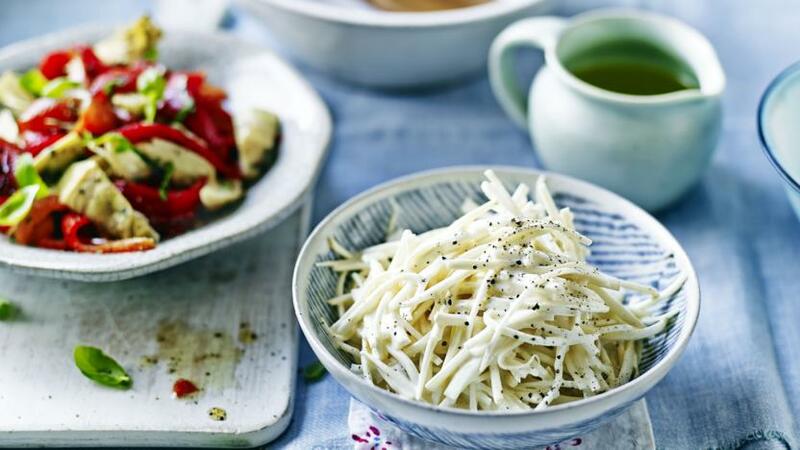 Celeriac remoulade is one of the simplest salads you will ever come across, perfect as a side dish or with some leaves for a healthy light lunch. Put the celeriac in a bowl and cover with approximately 100ml/3½fl oz cold water. Add the lemon juice. Toss well to prevent it going brown. Mix all the dressing ingredients together and season with salt and pepper. Drain the celeriac, toss in the dressing and leave to soften for 30 minutes before serving. For the best results, use a mandolin to slice the celeriac into matchsticks. However, if you’re pressed for time, a food processor gives good results. Use the largest grating attachment to give a coarse grating, rather than matchsticks.